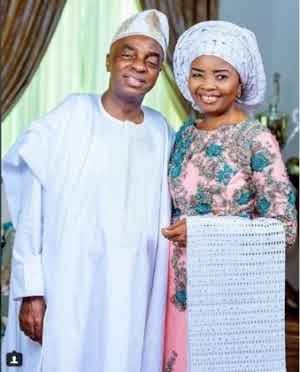 Famous senior Pastor of the General Overseer of Living Faith Church aka Winners Chapel, Bishop David Oyedepo and his wife, Faith, are celebrating their 36th wedding anniversary today August 21st. 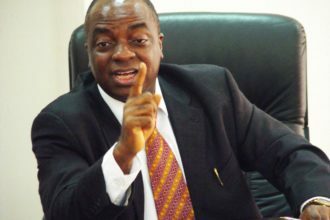 Bishop Oyedepo got married to Faith in 1982 and have four children. 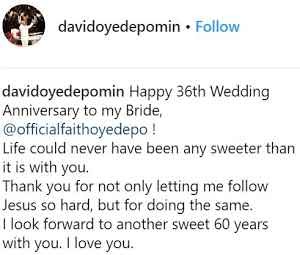 ”Happy 36th Wedding Anniversary to my Bride, @officialfaithoyedepo ! “Life could never have been any sweeter than it is with you. “Happy Wedding Anniversary, my affectionate husband of 36 years! You are the most daring, fearless, thorough, humorous, visionary, energetic, passionate, generous, spiritually depth-filled and diligent man I know and I celebrate you with passion! “I am so privileged, blessed and honoured to be such a part of you; and I am ready for what God has for our near 60 more years together. With all my love and deep appreciation, Faith Abiola Oyedepo”.